Gene Bjerke took a course from Ted Moore at the Mariners' Museum in Newport News, VA. 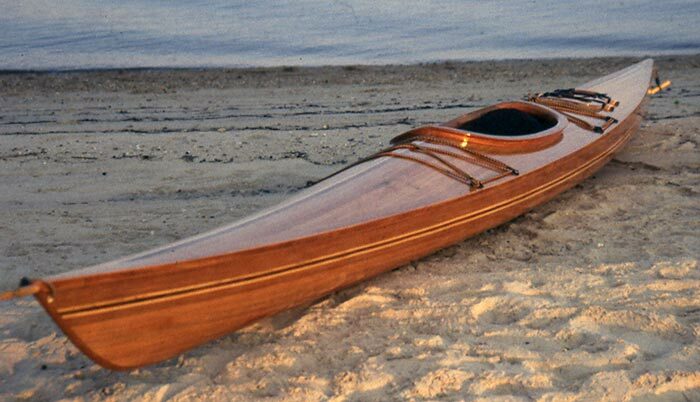 The course was on fine woodstrip kayak construction, and Gene was lucky enough to end up with the boat he worked on in the class. It is a Steve Killing Resolute design (16'6" x 25"). He then spent 18 months working on it as he could, while fitting it in around his regular life. He named it Gypsy (after another well-known stripper) and launched it in October 2001. Gene uses GYPSY on the many creeks and marshes in southern Chesapeake Bay.